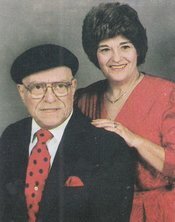 Louis Anthony Colombo was 66-years-old when he passed away on Saturday, March 5, 1994. A native of Hazelton, Pennsylvania, Mr. Colombo studied music and became an authorized teacher with the Schillenger System. He was a member of "The Stylers", a musical trio. Mr. Colombo lived in New York for 20 years and also lived in Miami, Florida for 20 years. He retired to Birmingham, Alabama in 1987 and became Choir Director of St. Patrick Catholic Church. He was married to Anna Colombo, who is also now deceased. Mr. Colombo was a Past Grand Knight of the Knights of Columbus and a member of the 4th Degree. He was a charter member of Council 10567 at St. Patrick and was instrumental in its founding. Editor's Note: We welcome any contributions to this page from any friends or family of our brother Knight Lou Colombo. If you were one of the many who celebrated the life of Mr. Colombo and you have any comments or stories about Lou that you would like to share, please e-mail Louis J. Muro. We also welcome any photos of Lou that you might have. To send an e-mail to Mr. Muro to submit comments, click here to go directly to his contact page. Doris Moody: I remember Lou well. He is totally responsible for my accepting the challenge to play piano. I will always be grateful to him for his persistence in telling me that I could do it. His famous words were always, 'You got the job, Doris.' He would always say that when I would try my best to please him with my playing. I remember Anna and Lou's wedding so vividly. I was pregnant with Jonathan at the time and they were worried that he would be delivered and interrupt their accompanist's ability to play for their wedding. It was such a sweet ceremony. He sang an original song to Anna at their wedding (right after they took their vows). It was called 'I'll Take Care of Your Cares'. Very sweet. That Lou; he was indeed a charmer.